Deputy Senate President Ike Ekweremadu, Nigerian Police and Nigerian Senate. 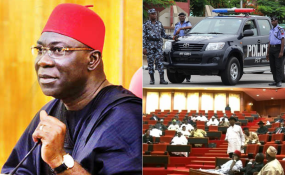 Deputy President of the Senate, Chief Ike Ekweremadu has said that the federal Government and its functions must be trimmed if the country is to be administered effectively. This is even as he stated clearly that the solution to Nigeria's security situation was the decentralisation of the Police and allowing state police to operate. Speaking in an interview with newsmen, he said that the federal government as currently constitution was too large and difficult to operate. The DSP noted that the states had little roles to perform whearas the the federal government is over burdened with responsibility. "We believe that the Federal Governemnt as presently constituted is too big and we need to adjust it. In a situation where you have in the concurrent list only about 16 items, most of the other things are in the exclusive list. "It doesn't make sense: so we need to find a way of trimming the Federal Government to the benefit of the component states so that some of these issues don't become federal issues and that is the idea of federalism. "We are looking at that: things like arbitration, agriculture, environment and such issues. Some of these things should go to the concurrent list and even Police," he said. Speaking particularly about the police, the Deputy President of the Senate pointed out that each state varied in the kind of security challenges and the kind of policing required. On the fear that state government could hijack the force in their states, he said that there should be a commission to oversee the state police just like the NJC over sees the judiciary. "We cannot decentralise the police now because some people are still opposed to it but i think it is beginning to make sense that you cannot be able to deal with our security situation in Nigeria except we change our security architecture. "There is no place in this world where there is a federal system, has a unitary tyoe of policing which we have now and that is why we will continue to get it wrong in solving our security problems. "It is not going to work until we change the architecture of our policing: a federal state as big as Nigeria must have to adopt a decentralised police. "This means that in Sokoto they will create their kind of Police, in Kano they will create their own: the kind of Police that will work in Kano may not necessarily work in Enugu. "But we need to first take Nigerians to the level where they will understand this. "He said that the fear of abuse by state government can be dealth with by creating a commission that can monitor the police like the NJC monitors the judiciary." he said. Ekwerenmadu went on to stress that Local Government should also be given some level of autonomy so that they too can perform their functions. He said that the reason for scrapping LGA account and merging with state government account was that the states could contribute some money to what the LGAs receive from the FG. "We need to create some level of independence for the local government especially in the area of funding. Look at section 162 of the constitution where the issue of withdrawing the LG account was created. "So I believe that if that is abrogated, local government can now get their funds directly. It is not as if we are trying to create something new. "I was a local government chairman in 1997 and we were getting our funds directly from the Federal Government. "So we want to guve the loca government that level of autonomy so that they are able to perform their constitutional responsibilities.